I baked one more bread, this time it is from Ukraine. This is just a simple delicious garlic bread with lots of flavor. I got this recipe from the book Mamushka a cook book by Olia Hercules. When I bake bread from other part of the world and get it right, I get immense satisfaction. After debating whether to bake today or tomorrow I made this Pampushy/Ukrainian garlic bread. The pampushky are traditionally served with red borscht. In Ukraine, they use new or wet garlic, I couldn’t find it here, so used regular garlic. Also, nowadays I get one additional taste tester for my recipes, yes, my hubby’s co-worker. She is from Ukraine, as usual my hubby shared this bread. She immediately said this is pampushky, my hubby had only mentioned it as an Ukrainian garlic bread. I had kept my faith towards the recipe and did not make any changes. She said it exactly tasted like the way It would tastes when her mother makes it. This is simple recipe, make a sponge on first day using half of flour, yeast and sugar and keep it in refrigerator. The next day, mix rest of flour and do a single fermentation and bake it on high heat. I am skeptical of baking bun type bread at 425 F for 22 minutes, but that high temperature is required, or you can’t golden beauty at the end. You need fresh parsley and garlic to finish it this bread, but as usual I didn’t have parsley. So, I used cilantro (you can use parsley in it), since I don’t have time to run to store. Pampushka in Ukrainian means plump women, this pampushky is plump bread and goes well with good soup. We ate it without soup they are great even after one day. I baked it in the evening, had a few and the remaining the next day as breakfast. These are best with touch of herbs and garlic and salt crust and soft fluffy interior. Give it try you will love it, everybody loves good bread isn’t it? Pampushky/ Ukrainian garlic bread, simple and delicious bread goes well bowl of soup. First make a sponge by dissolve the yeast and sugar in warm water (make sure it is warm water not hot). Add half of the flour and mix roughly. Cover with clingfilm and leave to proof in the refrigerator overnight. The next morning, add the rest of the flour and 1 ½ teaspoon of fine sea salt to the starter and knead on a well-floured work surface until the dough is smooth and comes away from your hands easily. Divide the dough into 8 pieces of 77g and shape into round buns. Put them side by side in an oiled round ovenproof dish or a 9 1/2-inch round cake tin, cover and let them proof room temperature, until doubled in size. They will join just like hot cross buns do. Preheat the oven to 425°F. To make the basting oil, simply stir the crushed garlic and cilantro into the oil with a small pinch of sea salt and let it infuse. I absolutely love garlic bread this option looks so good! You alwasy a have the best bread recipes. I need to make this at home. What a treat! 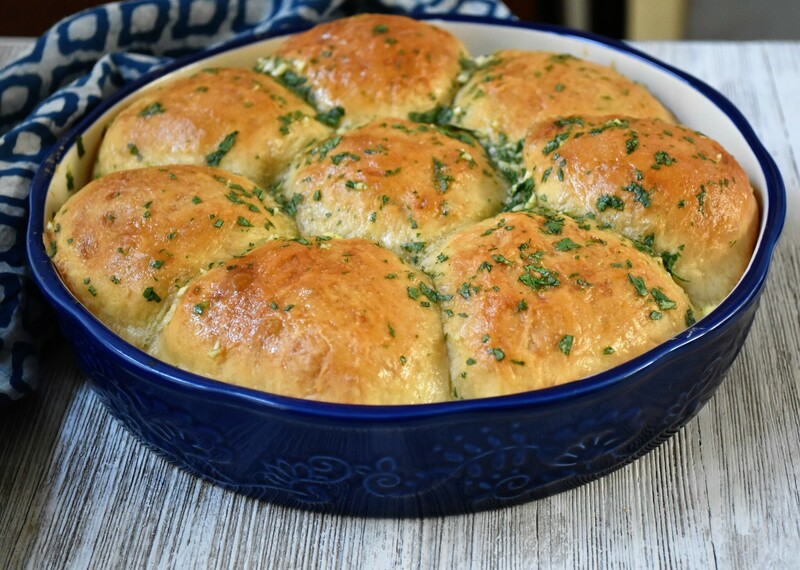 Such a lovely recipe…I absolutely love garlic bread, and I’m really liking this ukrainian version…yum! HAHAH…I am UKRAINIAN!! My mom and baba would make garlic rolls. OMG they were sooooo good. This post brings back some wonderful memories….and how I miss their delicious cooking. I love garlic anything and garlic bread is my favorite. This sounds so absolutely delicious. 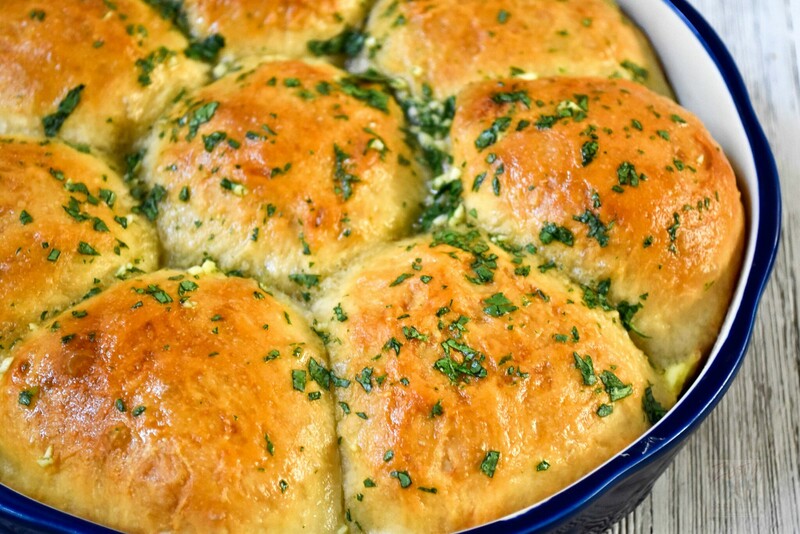 I love the sound of Ukranian garlic bread.. something new for me to try. 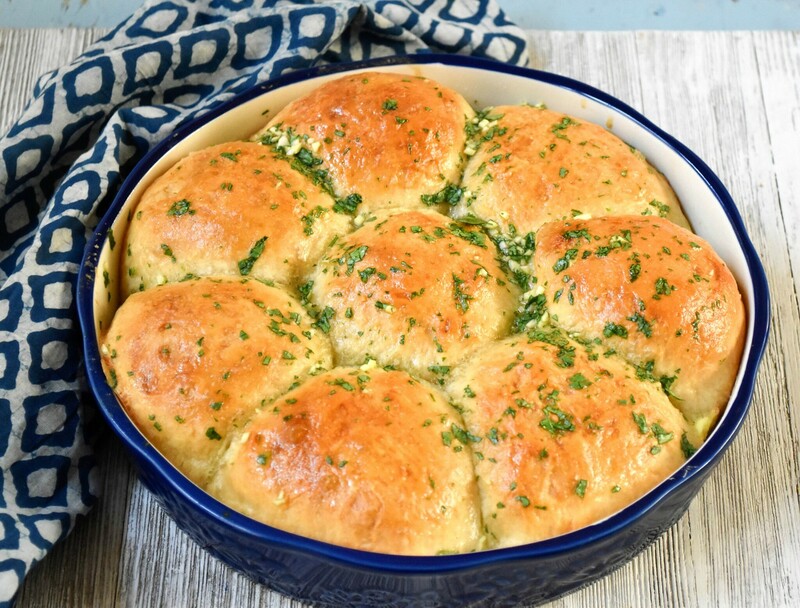 This garlic bread looks and sounds fabulous! 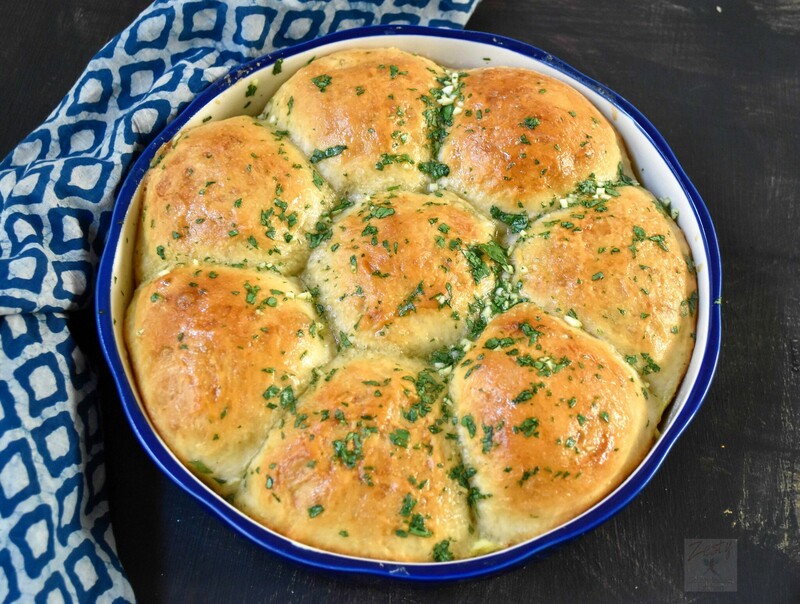 I haven’t made garlic bread for so long…my family would love this version! This looks so perfect. I love garlic bread. There something absolutely irresistible about garlic bread, right? THis recipe is perfect for upcoming weekend.